First, this isn't any sort of a guide, nor informative post. If that's what you thought or seek, there's plenty of other bloggers more capable than myself with PvP playstyle. Such as: Cynwise's Battlefield Manual and Arena Junkies. 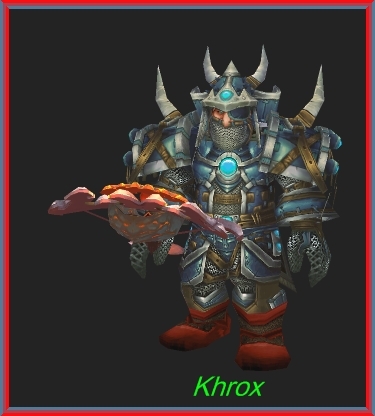 This post is more about that little dwarven bm hunter, Khrox, and his current state of affairs learning to be fairly good in bg's while trying to progress into some arena and rbg action. Now then, Khrox has not yet experienced many of the regular battlegrounds. He's still stretching his wings so to say, or flexing his muscles perhaps. lol. So, a little recap here to bring everybody up to the same page. Khrox's first attempt at bg's was WSG. Not the best choice judgeing from that experience. He was horribus bad, spent the whole battle unable to leave the graveyard, and was the reciepiant of such chat box abuse it was weeks before a second attempt appeared. The second attempt was AB. At the very least, he managed to do some fighting. Enough so to gain some of the groups' praise for being a "huntard." Heck, any improvement was acceptable at this point. It was like, okay, at least people know I'm there...rofl! With no pvp gear, no real experience and little more than a simple desire to learn, those random gods finally smiled upon Khrox. Along came a guild mate experienced in pvp. He took Khrox on an "in-battle tour" of Tol Barad. He advised doing all the battles and all the dailys for gearing up fairly quickly. Now, this, was his real beginning. To start with, Khrox was pointed in the direction of his own profession, leather working. Whoa there! He actually had two beginning pvp mail pieces of gear there he was unaware of. (it's okay, you can yell "noob" if you feel the urge) I never really thought about the time span of all this, Khrox just jumped into the advice whole-heartedly. Before too awful long, he became completely geared in the Bloodthirsty stuff. Less than a month I'm sure. He still died often enough, but was finally killing a fair amount as well and dealing a lot of enemy damage in the meantime. New gear at least every other day, where comes the current point of being about fully outfitted in Vicious gear along with some stuff from the Molten Front-Firelands zone. And if the bg chat box is any measure of success, then Khrox must have some sort of reputation amidst the enemy ranks. The constant flow of /spit, /makes rude gestures, and un-translatable orcish langage being tossed his way would be clues. Then there's that fact that healers run like all get out when he comes into a node, and groups of horde suddenly find him a very interesting target. Back to the bg's list though. Tol Barad has been about milked for all it's worth for some time. Khrox's gear is capped out with honor point stuff, he can't get any better there. He has his pvp Drake, and is a short time away from the spectral steed mount for his collection. AB is one of his favorites at the moment, though it began as a filler inbetween TB battles. He has been in SotA one time, and really needs to become more familar with that bg and it's objectives. This weekend though has found him trying out the Call to Arms: Twin Peaks. This is a faily simple zone in so far as layout, but simplicity stops there. The battles are fierce. Never having done this bg before, it's been interesting to find his place in being useful to the group. So far, it would seem he works best at being a peeler for his teams flag carrier, although several other options have shown promise. As usual, targeting horde healers always produces some gruesome yet fun situations. Especially if they're trailing behind a small group trying to protect someone who has grabbed our flag. LOL! Talk about an instant group peel! Enough rambling on now. Khrox is at that point where he needs to progress into arenas and rbg's. This means better gear is needed, the kind that comes from conquest points. This also means Khrox needs to team up with some people. Now we have a small problem. The "guild." Some may remember me generally speaking about some problems the guild has been in. Well, things haven't become any better over the past three weeks. Many key, active players have left the guild. The guild leader? As much as I have taken a likeing to her over the time of my membership, has never been a really strong leader in so far as focusing on some sort of guild direction, and currently fails at "leading" anything. (my personal opinion) In my fragmented mind, a guild leader is suppossed to actually "lead." At least, in some way, shape or form. The officer core? Well, pretty much gone or non-existant from what I can see. I actually got started on forming a 2v2 team with one of the guild mates. We got as far as deciding to use skype, and I haven't seen him in-game since. A week now. BTW: that is the infamous Lava Bolt Crossbow Khrox is armed with, the one that does sound like a gun!! !